Congratulations Con! We knew you could do it! You are definitely a safe driver. So maybe you needed to drive more crazy (like Aki) to get your license, ne?! Wow you are great. 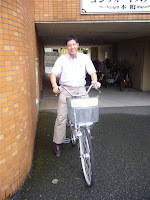 I hard it's very hard getting the driver's license in Futamatagawa. A Driving Tip in Foreign Country,especially Asian. 1. Always keep small bills in the car. 2. In case you stopped by police, pretend to be French. 3. In case No. 2 did not work, go to No. 1. 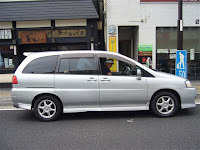 I had heard it before from my friends about getting Japanese driver's license is so hard. In fact, get driver's license in Taiwan is not so difficult as Japan.I'm happy because we can use Taiwan's driver's license in Japan!! But I don't have either Taiwan's nor Japan's driver's license so I can't drive here in Japan anyway haha. Let's ride bicycle for heath!